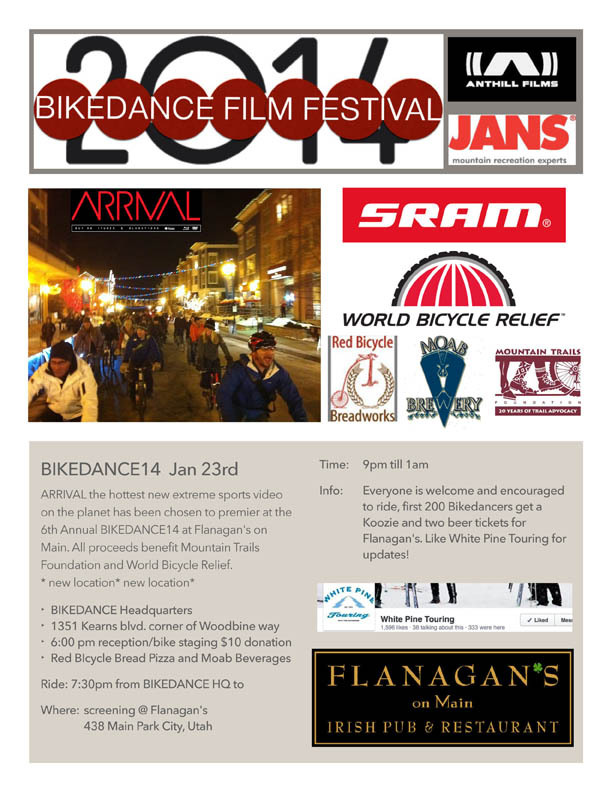 BikeDance, the bike community's answer to Sundance Film Festival, will be held in Park City on January 23, 2014. The event will run from 6 pm to 1 am. The night kicks off with a reception and bike staging with pizza and beverages ($10 donation) followed by a pre-movie ride starting at 7:30 from the BikeDance Headquarters at 1351 Kearns Blvd. The movie will show at Flanagan's – located at 438 Main St. in Park City, Utah starting at 9 pm, with festivities until 1 am. The Festival will feature the premiere of the movie Arrival, billed as the hottest new extreme sports video on the planet. The mountain bike freeride film features Utah rider Mitch Ropelato, among other stars. Proceeds will benefit Mountain Trails Foundation and World Bicycle Relief. For more information, contact White Pine Touring at 435-649-8710.